A new and powerful addition to the Super Overclock Series takes place today, as the leading manufacturer of motherboards and graphics cards, Gigabyte, announces the GTX 470 SOC. Graphics Card in the Super Overclock Series must go through an innovative GPU Gauntlet Sorting process, while being equipped with an Ultra Durable VGA Board in order to qualify. 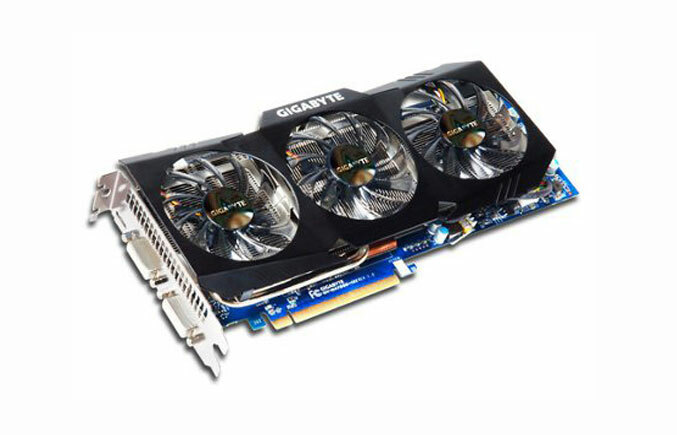 The Gigabyte GTX 470 Super Overclock Edition is equipped with an nVidia GeForce GTX 470 GPU. The nVidia GeForce GTX 470 GPU is based on a forty nanometer processor and an advanced GDDR5 memory technology. The GeForce GTX 470 comes with great features like Microsoft DirectX 11 and nVidia PhysX, leading to amazing high definition gaming experiences and performances. The GTX 470 SOC also comes equipped with features like the WINDFORCE 3X , 14 phase PMW design, OC Guru graphic card smart tuner and voltage read point. The Core of the GTX 470 SOC GPU manages to run at 700 MHz, while for the shaders it runs at 1,400 MHz, thus delivering twelve percent more performance compared to the normal nVidia GTX 470 (reference model). The Gigabyte GTX 470 SOC also has a seventeen percent decrease in power consumption, compared to the reference GTX 470.